19th April, Bangkok: Last year's champion, Yanne Saebe of Thailand celebrated a double victory by winning the ABF Tour Thailand 2012 Women's crown for the second consecutive time while two-time ABF Tour TOC winner, Wu Siu Hong of Hong Kong won the Men's title. Yanee Saebe started off well with a strike in her opening frame but Chantanee Sarnswang responded well to level things up at the third frame. Yanee rolled a double in the fourth and fifth frames to open up a gap of 9 pins as her opponent failed to match up to her opponent. Another three consecutive strikes from frame 7 more or less sealed the match for the Thai youngster but Chantanee fought back with three strikes of her own but her late charge proved futile going down 206-223. The champion had edged Sharon Limansantoso of Indonesia, 202-195 in the first semi-final to book her spot in the final while Chantanee defeated Korngunya Aree in the other all-Thai semi-final, 229-197 to face Yanee. Yanne had earlier breezed through Round 1 beating compatriot Siraya Chongvarin, 197-167 and Nunmanut Chatchaisiri 199-168 in Round 2. 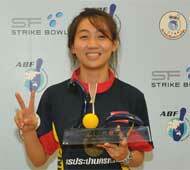 Chantanee beat Kim Eun Jung of Korea, 162-156 in Round 1 and Milki Ng of Hong Kong, 234-189 in Round 2. Meanwhile, two-time ABF Tour TOC winner, Wu Siu Hong was unstoppable as he easily defeated Wicky Yeung in the all-Hong Kong final, 210-174. 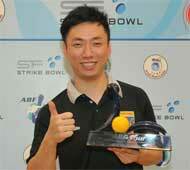 Wu started off with a strike but encountered a setback with a split in the second frame. Yeung also had an opened frame in the third and by the time Wu bounced back with three strikes in a row from frame 4, Yeung had no answer and he had another open frame with a split in the eighth. The champion edged tour debutant, Kang Bo Long of Malaysia, 202-190 in the second semi-final to book his spot in the final while Yeung thrashed Kuwait leg champion, Hareb Al Mansoori of UAE, 238-167 in the first semi. Both had impressive passage to the semi with Wu posting the highest game of 278 to beat Ryan Lalisang of Indonesia in Round 1 and another big game of 258 in Round 2 when he beat Thailand's Badin Lerdpiriyaskulkut. Yueng ousted last year's men's champion, Krichawat Jamparkao of Thailand, 212-202 in the first round and UAE's Shaker Al Hassan, 244-191 in the second round. Ms Suwanee, Deputy Managing Director of SF Cinema City presented the trophy to the women's champion while Ms Vivien Lau, ABF Tour Chairman and FIQ secretary general presented the trophy to the men's champion. The next stop will be in Cairo, Egypt on April 30 after the 14th Sinai International Open. This year's ABF Tour consists of eight legs - four in the Middle East without women division and four in East Asia with women division.